Put It On! Lush, Thick Lashes with Red Cherry! NailPolishCanada.com offers many beauty products along with Red Cherry Lashes, a product of Troika International. The beauty website knew how much we love Lash enhancement, so they sent us some lashes to try! We wore the lashes to events, wore them for photo shoots and through our everyday life when we felt the need to look extra pretty. #43 Red Cherry Lashes, #202 Red Cherry Lashes, and #76 Red Cherry Lashes all in black. 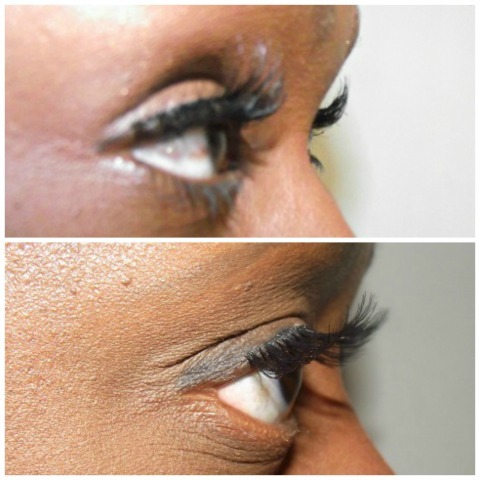 The lashes are made from human hair fibers, so the feel and look of the lashes looked and felt great. We chose elaborate lash styles, because that’s our preference, but Red Cherry offers styles for everyday wear as well. With a bit of mascara, we could easily control the lashes to stay put and out of our eyes. As an adhesive, we were given Troika’s Mini-Gloo, which turned out to work better then some leading adhesives we use on the regular. No itching or discomfort, easy to apply to the lash base and dries quickly for easy application. The lashes can be worn a couple times before they’re totally done, and Mini-Gloo can be easily removed from the lashes after wear. Lashes are made from human hair fibers. Mini-gloo is clear, so there is no way you’ll see clumpy glue on your eye lids. We suggest trying the Red Cherry Lashes brand and let us know what you think! Newer Post The Fields Annual Party At The MMVAs: Pictorial Older Post Toronto’s Fashion Connection: Stylist Box!